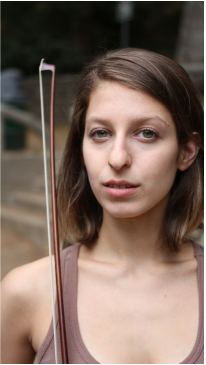 MARINA KIFFERSTEIN is a violinist and composer based in NYC. Equally comfortable in major international venues and DIY spaces, she enjoys a diverse career that encompasses chamber music, orchestra, and solo performances. She is a founding member of TAK ensemble and The Rhythm Method string quartet. Marina performs across the US and internationally with TAK and TRM, as well as with ensembles including the International Contemporary Ensemble (ICE), Talea, Wet Ink, the Nouveau Classical Project, the Da Capo Chamber Players, Shattered Glass, the Ensemble of Lucerne Festival Alumni, and others. A strong supporter of new music, Marina has performed and commissioned an extensive repertoire of music by living composers. She has worked closely with 20th century masters such as Helmut Lachenmann and the late Pierre Boulez, as well as a multitude of composers ranging from early career to highly acclaimed; as a soloist and chamber musician, she has premiered hundreds of new works. Her own compositions have been performed across the U.S. and Europe. Marina has been a featured performer at international music festivals including the Festival Musiques démesurées in Clermont-Ferrand, France, Musiikin Aika in Viitasaari, Finland, and the Lucerne Festival in Switzerland. She has held residencies at the Avaloch Farm New Music Initiative and Mount Tremper Arts, and fellowship positions at the Sarasota Music Festival, the Bang on a Can Summer Music Festival, The Manchester Music Festival, the Institute and Festival of Contemporary Performance at Mannes, the Montreal Contemporary Music Lab, and the Lucerne Festival Academy in Switzerland. Concerto solo engagements include the premiere of Ryan Pratt's K. Tracing with the Wet Ink Ensemble under the direction of Eric Wubbels, Luciano Berio's Corale with the Tactus ensemble under the direction of Kyle Ritenauer, as well as the North American premiere of Hindemith's Kammermusik No. 4 with the Oberlin Wind Ensemble under the direction of Timothy Weiss. As an orchestral musician, Marina has held concertmaster positions with numerous orchestras including the Orchestra of Lucerne Festival Alumni, the Lucerne Festival Academy Orchestra, and the Orchestra for the Next Century, and has played under the batons of conductors such as Pierre Boulez, Sir Simon Rattle, David Robertson, Matthias Pintscher, and many others. She has performed solo, chamber music, and orchestra concerts across America and internationally, in venues such as the Walt Disney Concert Hall, Lincoln Center, and Carnegie Hall, as well as across Switzerland, France, Germany, Luxembourg, Austria, Italy, Iceland, Finland, China, and Singapore in venues such as the KKL Lucerne, Kölner Philharmonie, La Salle Pleyel, the Beijing Concert Hall, Harpa Concert Hall, and the Esplanade. Outside of the realm of performance, Marina is a contributor for WQXR's Q2 Music, the blog I CARE IF YOU LISTEN, and was formerly a staff writer for the Oberlin Conservatory Communications office. Marina is on violin faculty at the United Nations International School in Manhattan, and at the Composers Conference summer festival. Former teaching positions include the Washington Heights Community Conservatory, and Oberlin Conservatory (secondary instruction). She has held chamber music residency positions at Columbia University, Bowling Green State University, Tulane, and New York University, among others. Marina holds a Masters degree in contemporary performance from the Manhattan School of Music, where she was the recipient of a full scholarship in the studios of Curtis Macomber and Laurie Smukler. She received a BM in Violin Performance and a BA in English with a Creative Writing Concentration from Oberlin College and Conservatory in 2012 as a student of Milan Vitek, where she was the recipient of a Conservatory Dean's Talent Award and a John Frederick Oberlin Scholarship. Other influential teachers include Ecaterina Gerson, Alexander Yudkovsky, Tim Weiss, and Per Enoksson. She is currently a DMA candidate at the City University of New York Graduate Center under the tutelage of Mark Steinberg. Marina plays a modern Hungarian violin by Zsolt Feleghazy.